The star of our latest campaign may seem worlds away from the flashy glamour of big and bold advertising shoots. 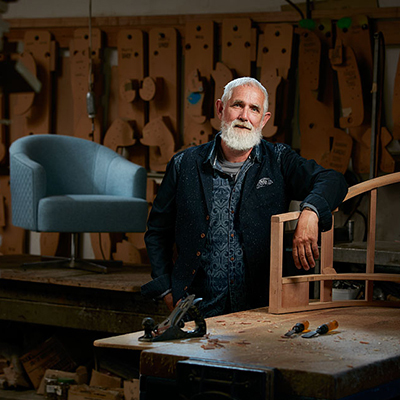 However, as a key member of the team for over four decades, Bruce McKenzie was ideal for showing the ‘care in craft’ – the heart and soul of our work at Kovacs. A keen outdoorsman, Bruce is typically reserved and soft-spoken by nature. So the lights and styling were a big change. The results speak for themselves, and our ‘talent’ looks every bit at home in the factory because, well, he knows the place like the back of his hand. In this work two particular pieces, the Euro lounge suite and the Ranfurly chair, stand out as favourites to make. Hunting and fishing are his life outside of work. With 21 trips logged deer hunting on Stewart Island, numerous journeys around the high country lakes in an old Series 1 Land Rover and countless hours duck shooting at Lake Ellesmere Bruce has experienced “a good part of my life” in New Zealand’s great outdoors. Retirement looms a few years down the track. But in the meantime the physical demands of the work, the ‘young man’s job’ cutting up large wooden components, are handled by a man who’s strength and stamina is built with regular time spent wading miles up Canterbury’s riverbeds.